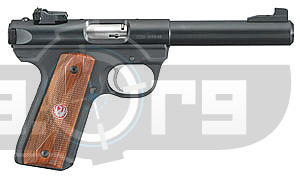 No other .22 LR pistol provides the feel of the classic 1911 pistol with the proven reliability and value of the Ruger 22/45 pistols. In addition to the identical grip angles, the 22/45 features the same fire control locations (manual safeties, magazine releases and bolt hold-opens) as the 1911, making it perfect for .45 caliber shooters looking for an affordable way to train. The 22/45's internal cylindrical bolt construction ensures permanent alignment and higher accuracy potential than conventional moving-slide designs. Its accurate sighting system is comprised of a precision-adjustable rear sight with fixed front sights and a drilled and tapped receiver for Weaver-style scope base adapters (included) for easy mounting of optics. Ruger's patented loaded chamber indicator provides visual and tactile indication that chamber is loaded. Other great features include a bull barrel, a contoured ejection port, an easy-to-grasp tapered bolt ears, and a conveniently located push button magazine release on the left side of the frame. Two magazines and hard plastic case are included with each pistol. 9-1/2" blued barrel. Checkered Cocobolo grip.